Announcer: Welcome to Marfa Mondays with your host, award winning travel writer and novelist, C.M. Mayo. C.M. 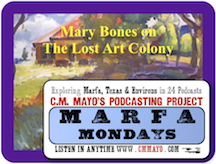 Mayo: Welcome to the Marfa Monday podcast from March 19, 2012. It was in late January of this year that I made the journey from Mexico City to Marfa and from there an hour south to the U.S.-Mexico border at Presidio-Ojinaga to see La Junta de los Ríos where the Río Conchos and the Río Grande come together. As I explained in the previous podcast, I wanted to open my book with a journey into the world Cabeza de Vaca would have encountered. Alvar Nuñez Cabeza de Vaca was the conquistador who got lost. Very lost. The first European any of the indigenous peoples there had seen, he wandered for eight hellish and fantastic years from what is today Florida through Texas and down to La Junta de los Ríos, and from there into trackless deserts... until, in 1535 in northwest Mexico, he happened upon a party of Spanish slave traders. Well, if you're listening to this some years after I've recorded it, I hope my book has been written and published, in which case, I invite you to visit my webpage, www.cmmayo.com, to read all about it. But right now, March 2012, I'm at the beginning stages and one of the things that, as a travel writer I believe is fundamental to really delving in and grasping the sense of a place is talking to artists. Not all artists are living. We could begin with the rock art, that is, the petroglyphs of the indigenous peoples, for there are many of them throughout the region. But that, though it will be in the book, may or may not be another podcast [Update: see #15 Gifts of the Ancient Ones], and in the previous podcast, an interview with Charles Angell, he did mention the petroglyphs. Today's podcast is about some artists who are, relatively speaking, of our time, though they have all passed on. Marfa is the best known town in the region. That's why I named the podcast series "Marfa Mondays" and it is indelibly associated with Donald Judd, an artist who moved to Marfa in 1971. You can be sure that in my book and I hope also later on in these podcast I'll be talking about Judd, his art and his very important legacies. But what interests me now as I begin the book with Cabeza de Vaca's arrival is this glorious, raw, violent, and at once beautiful landscape, and how artists see it, for they make a practice of seeing what others do not. So I went to Alpine. Alpine is a half hour's drive northeast, mostly east, on highway 90 from Marfa. In West Texas, distances are such that that puts Alpine right next door. Though less well known outside the region, Alpine, with some six thousand residents, is larger than Marfa and it is the home of Sol Russ State University, the University of the Big Bend. On the Sol Russ campus is a little jewel, the Museum of the Big Bend. Once you come in through the gift shop, you pass beneath the ghostly white model of the Quetzalcoatlus Northropi, the largest living thing ever to fly, a pterodactyl with a wingspan of some 40 feet. A tour of the museum is a tour of Big Bend history, from its geology and flora and fauna to the indigenous peoples, to the Spanish colonists, the Apaches and the Comanches, the Buffalo Soldiers, miners and ranchers, the railroad, the Mexican Revolution at the border, and into the 20th and our 21st centuries. But the reason I came on this day was to see the exhibition titled "The Lost Colony: Texas Regionalist Paintings." "The Lost Colony" refers to the summer art colony at Sul Ross, which began in the summer of 1932 and ended in 1950. Of the region's beauty, as Michael Duty writes in the introduction to the exhibition's catalog, "it is a place that has long called to artists who have been captivated by its natural beauty, its history and its people. In recent times, the area has also drawn the attention of writers and reporters who have written numerous articles touting the area's prominence as something of a center, albeit a far flung one, for contemporary art. Those articles focus primarily on Marfa and the influence that minimalist sculptor Donald Judd has had on the town". Later Duty adds, "There is no doubt that Judd's presence has had much to do with the increasing presence of both artists and collectors in the region, but he was certainly not the first artist to be so captivated". Well, I wandered into a most spacious, light-filled room. There were paintings by Mabel Vandiver including her 1922 "Davis Mountains" watercolor; oil paintings by Anna Keener including "Pioneers," "Dawn on the Rita Blanca,"; by Elizabeth Keefer, "Black Eagle Dance"; and by Julius Woeltz, the riot of color that is the painting "Kokernot Lodge" and the magnificent "Mitre Peak"; Xavier González's watercolor of 1942, "Alpine, Texas"; and works by Coreen Mary Spellman, Harry Anthony De Young, Beatrice Cuming, and Otis Dozier, of which my favorite is the 1947 oil on Masonite, "Ranch Country." William Lester, James Swann, Ethel Edwards, Alice Reynolds and Juanita Montgomery were also represented. "The Lost Colony" show has closed, but you should be able to find information and some of the pictures on-line. In this podcast, after having seen the show, I came back in with its curator, Mary Bones. C.M. Mayo: What gave you the idea? What sparked this exhibit? I've been here for 10 years. I do not have a museum studies background, but about the first month I was working at the museum a fellow walked into my museum and said, I'm here to pick up my paintings. I had no idea who this man was, but we quickly figured out, he was an early Texas art collector, and a few years before I came to the museum there was a really wonderful early Texas art show, so he came to pick up those two paintings. We got his paintings to him and as he was walking out the door, he remarked on two large murals that were hanging in my museum at the time and he said, "those are really fine painters and paintings." I went over and there was a small label with these two paintings identifying the two artists. One was a fellow named Xavier González and the other one was Julius Woeltz. That was the impetuous for the beginning of this whole wonderful experience and journey that I went on and finally, the culmination with this "Lost Colony" show. It's just a great story. C.M. Mayo: Well, I have to tell you, when I walked in, the first thing I saw was this painting that we're standing in front of, "Mitre Peak." I mean, you could just sit here and look at this painting for hours. It's glorious! And I thought who is this guy, how come I haven't heard of him!? Mary Bones: I know and that's what's so great about this show because the majority of these artists in the show are incredible artists. Julius Woeltz is my favorite. I love Julius Woeltz. I grew up in San Antonio. He grew up in San Antonio. It's a really interesting story with him. He was recognized for his artistic ability. He was selected at the time in San Antonio, there was a San Antonio Public School of Art administrator and she would go to the various schools and based on your academic record, your artistic ability, as well as you had to get a recommendation from the principal. There was a very elite group of students that went to art classes at the Witte Museum, and Julius Woeltz was one of those kids. He also studied at the Art Institute of Chicago. He also studied at the Academie Julian and what's really incredible about Woeltz is he was hired in 1932 to conduct the summer art classes and he's the fellow who brought to us the idea and the president of the university agreed to it the idea of a summer art colony here at Sul Ross. Woeltz would be with us from 1932 to 1936. He was going to go to Spain, but there was this little thing called a Revolution that kind of screwed up those plans, so he had to nix those, but he taught at Sophie Newcomb in New Orleans. He was really known as a fine muralist. I think he painted well over 30 murals in his lifetime. He very much was influenced by Rivera and Orozco. He and his very good friend, Xavier González, spent many summers down in Mexico and Mexico City looking at the muralists. He was a fine muralist. He eventually taught at the University of Texas for about 10 years, retired out of there in the '50s and returned to San Antonio where he really got back into his studio but unfortunately passed away in the mid '50s, so we lost a really great artist, but I agree with you, I love his work and the vibrancy of the colors is just astounding. C.M. Mayo: It really is glorious! And where we're standing in front of it you come into the room and on either side are these windows, which are very, I guess I would say tastefully screened, so that you can see the view but the light is not competing with the paintings. C.M. Mayo: The view is of mountains, which are very similar to the mountains in the picture. I realize Mitre Peak is over towards Fort Davis. We're not looking at that out the window. Mary Bones: You know I don't know if we can see it from here. C.M. Mayo: Oh, really we might see it? Mary Bones: It's further to our north. C.M. Mayo: To the north. Okay. Mary Bones: I think what was important about having these windows open was the reason why people came here to study at the art colony, it was a draw of the region. That's what they [?] through. It was all plein air painting that got the students out of the studio and off campus, so they went down to Big Bend, they went up into the Davis Mountains. They used the landscape and the terrain as their guiding principle for their students. C.M. Mayo: The light is really extraordinary. Mary Bones: The light out here is beautiful, I agree with you. It reminds me a lot of maybe the Santa Fe area where you get just those incredible skies and the color is just astounding. C.M. Mayo: And you can see for such distances. Mary Bones: Oh, amen. Yes. C.M. Mayo: In every direction there's a different mountain range. Mary Bones: Very much so, and you have different types of mountains here, too. The Davis Mountains here in Alpine, you have volcanism. If you go further south you start seeing more sedimentary and older rock. So you get different types of geology within a very small area. C.M. Mayo: It's a geologist's fantasyland. C.M. Mayo: There's something to see every mile! Mary Bones: There is. It is one of the great places for geologists to come because you can pretty much see it all in a very small part, quickly done. well, first of all just in the hallway coming in, the art was of a quality that really surprised me, and then to see this fabulous piece by Julius Woeltz of "Mitre Peak." It's really, really stunning. I'm still standing in front of it! Mary Bones: Oh, Xavier González. Mary Bones: Yes. Very much so.... Hi, Ruben Ramos! C.M. Mayo [to listeners]: What happened here is that we were interrupted happily and most interestingly by indeed, Ruben Ramos, who was one of the participants in the Trappings of Texas show that takes place every year at the Museum of the Big Bend during Alpine's annual Cowboy Poetry Festival in February. Trappings of Texas exhibits and offers for sale fine western art and the best in cowboy gear, from saddles to lassos and spurs and you name it. Ruben Ramos had driven quite a distance to show Mary Bones some of the pieces, very fine hunting knives he had made for the show. One had a handle made of mammoth tusk. Okay, back to our interview. C.M. Mayo: So Xavier was studying in Mexico City? Mary Bones: Chicago Institute of Art. He also worked as an illustrator while he was there to kind of make bills and then he decided to move to San Antonio to work with one of his mother's brothers, a guy named José Arpa, who's big, big, big in San Antonio. He had a big art school, so González went down there, worked under Arpa, also became an instructor himself and he taught at the Witte these Saturday classes that were designed for these very talented kids drawn from the San Antonio Public Schools and one of his students was Julius Woeltz. They began a long relationship. They did a lot of stuff together. They went down to Mexico, down to Mexico City to look at the fabulous murals and you know that really influenced a lot of their work. I mentioned that Woeltz was a fine muralist, so was González as well. And he eventually wound up teaching at a school, Sophie Newcomb College, but he also participated in art colonies at Christoval, which is a little town south of San Angelo, and then in 1932, Woeltz was here to conduct the summer art classes. He approached the president of the school, Dr. Morelock, and they agreed, and that's the beginning of the summer art colony and Xavier González was his choice to lead the very first art colony. So it's really a lovely relationship between these two men. C.M. Mayo: So there was a bit of age difference. Julius was much younger or a little bit younger? Mary Bones: Oh, I would probably say maybe eight years younger than González, but not too huge of an age difference. González, he and his wife, Ethel Edwards, were married here. According to the family legend, the wedding was supposed to be held in New Orleans but Ethel still had a fellow that was still very interested in her, and so they were very concerned that he would show up, cause a scene, and so they decided to hold the wedding here. This was in 1936 after the last art colony session for the summer. González and Ethel married out at the Brown Ranch and Julius Woeltz was González's best man, so it was nice. It's a nice story. They did drift apart years later, probably in their '40s they really drifted apart and went their own ways, but it was I think a very good friendship and they worked very well together and supported each other in their careers. C.M. Mayo: Well, it's just spectacular to see their work hanging on the same walls right next to each other. we're looking at "Alpine Texas, 1942." It's a watercolor and the one next to it is by Julius Woeltz and this is the "Kokernot Lodge," which was painted in the 1930's. And they're actually very different. you know he started working in watercolor. With Woeltz on this piece, very straight forward, very Texas regionalism. I love the use of his color, the vibrant colors. This has turned out to be one of the more popular pieces in the show. What's kind of cool about this painting, just from a historic standpoint, is it's the very first art colony was held Kokernot Lodge. C.M. Mayo: Where is that? well, when the school originally was founded there was one building, the administration building, so this Kokernot Lodge was a place for kids to go. They would have big barbecues and meetings, get-togethers and those sorts of things, but the art colony used Kokernot Lodge as a place to meet and then they would radiate out from there, going out and doing plein air painting around the area, so it's significant that this turned out to be such an important piece in this show. C.M. Mayo: Well, I have to say it's my second favorite after "Mitre Peak." well, there are so many paintings here we couldn't begin to look at them all, but there's another bunch that's really interesting over on the right hand part of the gallery. I'm looking now at a painting called "Girl's Head, 1950" by William Lester, which I can't help noticing has been featured on a recent issue of Cenizo Journal, which is a wonderful quarterly publication here in Alpine. Can you tell me a little bit about William Lester and how his work came into this collection or exhibition, I should say? Mary Bones: Oh, yeah. I wish I had all these William Lesters. I really do. We're very fortunate, Charles Peveto and [Nancy and] Otis Welch to have lent two out of their private collections. The other two wonderful "Barren" and "Semi-Barren" are from the Panhandle-Plains [Historical Museum, Canyon, Texas]. he studied with Alexandre Hogue. He also studied with Olin Travis, but he studied with a really interesting guy named Thomas Stell, Jr. Thomas Stell, you can really see the influence of Stell on Lester. And Stell really loved these very interesting backgrounds, very minimal use of paint, very minimal use of amount of paint. Stell, he's from Cuero. I just really, really like his work, but you can really see the influence that he had on William Lester. Lester would come out here and conduct the art colony for two years, '49 and 1950, and the bulk of his career was spent teaching at the University of Texas at Austin. "A Girl's Head" is a really interesting piece. The fellow, Charles Peveto [the owner of the painting]... William Lester has passed away, but his wife is still alive, and he is a good friend of hers and he went over one day and took a photograph of Mrs. Lester and sent it to me, and you know exactly who the model was for "Girl's Head." It's a dead-on Mrs. Lester. It was just so cute to see it. But yeah, Lester's an incredible artist. I really liked him. C.M. Mayo: It reminds me of a Picasso, but it's definitely not Picasso. It's definitely something unique. Mary Bones: Yes. With Thomas Stell I also remember they talked about the importance of the color of the face and texture on the face and kind more of a flat background in this particular painting, and when you're with it, you can really see it. Unfortunately, photography and reprinting doesn't do it justice. But it's just a wonderful little piece. I'm so delighted that we had it in the show. C.M. Mayo: Well, now we've talked about three major artists who are all men, but one of the really marvelous things about this exhibition is that there are so many women represented, and some of them are also just amazing. Mary Bones: She turned out to be one of our other really popular artists from the show. We originally opened the show in Dallas at a fine art gallery, David Dike, and this particular piece, "Untitled," he could have sold that all day long. People were drawn to it. I think it's the color. You know, she got the sky right. If you live out here it's all about the sky, the colors, that heavy impasto. Just an incredible artist and she's so interesting, had this interesting career. She was a yeoman in the Navy. Before she came to Sul Ross, she had already written a book, Spontaneity in Design. She studied at Bethany College in Linsborg, Kansas. Her instructor was a guy named Birger Sandzén. He was from Sweden. She was very much influenced by his style. She I think spent four years with him and even became his assistant, so you can really see the hand of Sandzén on her palette. C.M. Mayo: We're looking at "Pioneers," which is also absolutely stunning. we actually found documentation in another collection where she had written down the work she had sold and this was one of the pieces. It wound up on a ranch here and now it's in a private collection, but she was only here for a year, but I think some important, important things happened during her tenure. She would go on, she would spend a good deal of her time in New Mexico. She taught at Eastern New Mexico University in Taos and then went up to Santa Fe. She continued working in her art, became a judge, and was a member of Artist Equity and she worked hard to establish the New Mexico Commission on the Arts. I just love her work and just this whole idea of this young woman getting in a car and hitting the road and coming to such a remote place to teach is just a great story. Now, I wanted to ask you, what is your favorite painting of all the paintings that are here? I can't do it. It's impossible. It's impossible for me. C.M. Mayo: Well, you've gone over every single painting and the little tags. Now, most of these have come from private collections, so that must have been a lot of work to hunt them down and get the owners to agree to lend them. Mary Bones: Yes. That was an interesting journey. We're very fortunate that we have a wonderful organization here in Texas called CASETA, which is the Center for the Advancement and Study of Early Texas Art. I put out a call and people responded, and so that, and they understood what I was asking for the duration, and so some people, perhaps their works weren't shown in Dallas but they would show them here in Alpine because they didn't want their best friends gone for so long. You know, there's a lot of work. You've got to always make sure to take care of these private lenders because if I didn't have those folks I would not have the quality of show that I have in this museum right now. I really wouldn't have and so they've just been wonderful people to work with, period. C.M. Mayo: What happened to the Lost Colony? People stopped coming in the '50s, is that right? Mary Bones: Yeah. In 1950, it was over. That was the art colony. We've kind of debated this, and we think what happened was you know what was happening in Europe finally hit the shores of the Red River. It finally made it into Texas. Regionalism, I think, had maybe become passé. There's also been talk about, you know, plein air painting also had become passé, people were spending more time in the studio. You know, it had a good run, eighteen years, that's a long time. And maybe also people were less willing to travel such distances to come to such a remote place. So I think there's a number of factors that played into the demise of the art colony. C.M. Mayo: Yet when I look around town and when I look at Marfa, there's a thriving art colony now. C.M. Mayo: I don't know if they call themselves a colony, but there are a lot of artists who have come here and are doing really interesting things. I'm thinking of Avram Dumitrescu. I'm thinking of Mary Baxter, who's out in Marathon. until you come out here you have a whole different view of what West Texas looks like and I think it's these wide open spaces, the big mountains. For us, in Texas, these are big mountains, and then just that sky. The sky I just always go back to as being just this wonderful, ever-changing, always surprising character that you live with every day. C.M. Mayo: It has a jewel-like quality to me on sunny days. There's something very special about the light here. C.M. Mayo: Well, for the artist today, although there may not necessarily have been a direct connection, in a way, what we're looking at are the ancestors of the current arts community. C.M. Mayo: I'm sure if we delved we'd find many connections here and there, since I think artists tend to travel a lot and know each other. Mary Bones: Very much so. C.M. Mayo: Dealers in common and teachers in common. well, especially with the art colony because to get these people to come out here, there were friendships first, and then encouraging these artists to come out here and come to this place. We had a fellow, Paul Ninas, who's an interesting character, but he was good friends with González and Woeltz, and they encouraged him to come out here and he did, without any idea of what he was stepping into, and just had an incredible experience here. C.M. Mayo: Now, the painting that I keep coming back to, "Mitre Peak" by Julius Woeltz, this is in the Sul Ross collection? Mary Bones: Yes. We are so lucky we don't have a lot of pieces, and that's so sad, of the artists that taught here, but we were very fortunate, "Mitre Peak" as well as "Kokernot Lodge" are in the permanent collection, so we are very fortunate to have his work here. C.M. Mayo: So they'll be hanging somewhere on the walls in Sul Ross? Mary Bones: Yes. Yes. They will be. Actually, if you ever come to the Museum of the Big Bend, "Mitre Peak" will be hanging in our assistant to the director's office and then "Kokernot Lodge" will be back over the fireplace where it should be in the director's office. So they will not be down in the collection. We just love these works so much we just can't put them away. C.M. Mayo: I can't say how much I admire this exhibition. It's really surprised me and I've been moved by the beauty of so many of these paintings. The show's going to end in a couple of days, January 29, 2012, so if someone were interested in viewing some of these paintings on-line, would that be possible? Mary Bones: You know, that's a great idea because we went through and we photographed everything that's in the show. I think that's a really great idea, if we could perhaps put up a slideshow on the museum's website, so people who missed out, did not have the opportunity to come or couldn't, could at least once again, could enjoy the works the way we've been able to do in person. I think that's a great idea. C.M. Mayo: Well, I hope you'll do it because I think over the years there will be an increasing amount of interest in this Lost Colony and these pieces. Mary Bones: Oh. Well, thank you. I hope so because all these artists deserve it. They really do. They're just incredible artists and great stories and it was a wonderful time here at Sul Ross, so thank you.